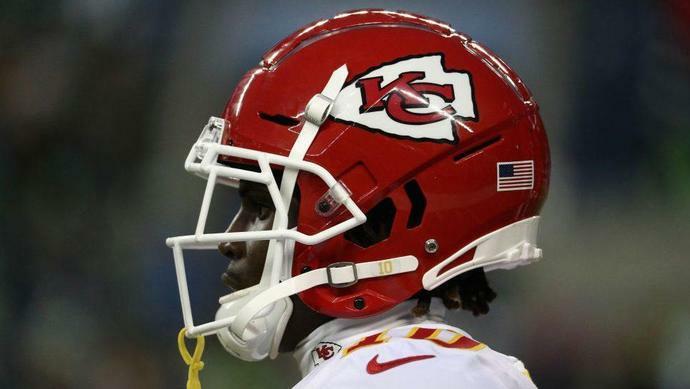 The Chiefs moved swiftly in November to sever ties with running back Kareem Hunt, after a video debunked his claim to the team that he had no involvement in an altercation at a Cleveland hotel earlier that year. The Chiefs now have another situation with a star player, and the local newspaper has called for similar decisive action. The Editorial Board of the Kansas City Star calls for the Chiefs to release Hill, if it's proven that he broke his three-year-old son's arm. Whether it can be proven that Hill broke his child's arm is a different issue. His name isn't listed on the incident report relating to the injury, but the incident occurred at his address. Crystal Espinal, his fiancee, is named in the report; according to the Star, she is currently pregnant with twins. Obvious questions become whether she or someone else other than Hill inflicted the injury, if the boy's arm was indeed broken. Then there's the equally obvious question, given the financial stakes of a situation like this, as to whether she or someone else will try to take the fall for something Hill may have done. Hunt's case turned on video. Without evidence that clear in Hill's case, it may be impossible to conclusively prove anything. Even then, Hill's history of domestic violence - largely overlooked as he became one of the best players in the league - will cloud not only this situation but also his career as it moves forward, absent conclusive proof that he is innocent. If nothing else, it could make the Chiefs wait for another year before making Hill the highest-paid receiver in the league.